Adelaide Johnson (American, 1859–1955). 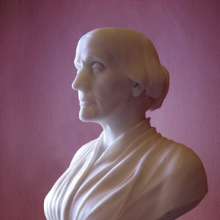 Susan B. Anthony, 1892. Marble. Collection of the historic National Woman’s Party, the Sewall-Belmont House and Museum, Washington, D.C. Unknown photographer. 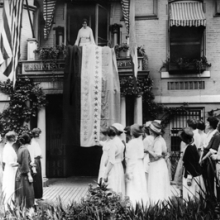 Alice Paul Unfurls the Ratification Flag at National Woman’s Party Headquarters in Celebration When Tennessee Became the 36th State to Ratify the Federal Suffrage Amendment, 1920. Albumen silver print. 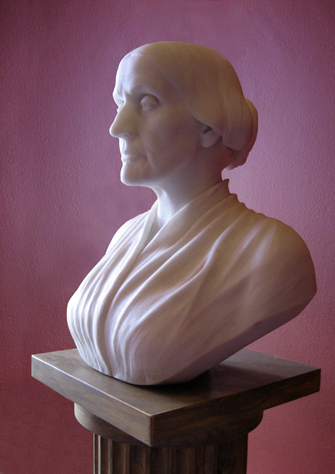 Collection of the historic National Woman’s Party, the Sewall-Belmont House and Museum, Washington, D.C. Votes for Women, the latest exhibition to be presented in the Herstory Gallery of the recently opened Elizabeth A. Sackler Center for Feminist Art, explores Susan B. Anthony’s contribution to the American suffrage movement, the contributions of eight other important American suffragists, and Victoria Woodhull’s historic run for the United States presidency in 1872. The exhibition draws upon the Susan B. Anthony place setting in The Dinner Party by Judy Chicago, and the lives of women whom Chicago chose to name as significant contributors to the fight for women’s rights in America. 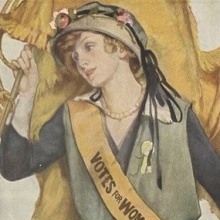 Votes for Women examines the methods and tactics used throughout the generations of the suffrage movement with more than sixty objects and images from the days of Anthony’s leadership of the movement, to the increased activism after her death in 1906, to the ratification of the Nineteenth Amendment in 1920. Votes for Women is curated by Melissa Messina, Independent Curator and former Research Assistant for the Elizabeth A. Sackler Center for Feminist Art.